In mostly all business niches interaction with a client is required. It’s essential that your contact information is easily accessible via the website – be it an email address, phone number or a chat room. Moreover, if you have to deal with constant appointments, there is a way to make the process even easier for you: eliminate phone calls and emails for online bookings. In WordPress it can be handled even without your personal involvement or revised when you have time. An Online Appointment booking system built into ready-made WordPress themes can make your work more automated and easy: you don’t have to personally monitor the available dates for booking, take calls, make notes, etc. Of course, there are several WordPress plugins that allow appointment bookings, but if you want to get a solution without additional costs or setup, a WordPress theme with such a tool built in by default is a great solution. 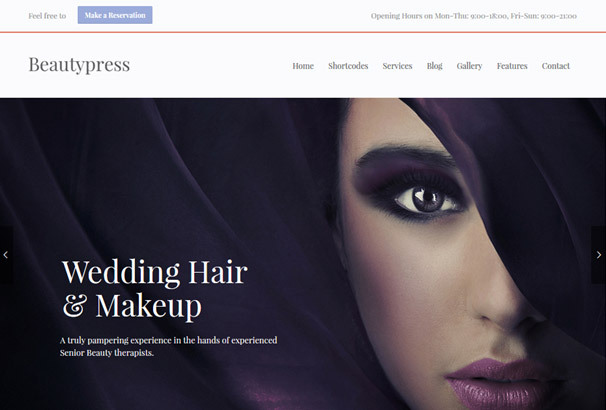 In this collection we’ve put together a collection of the best WordPress themes (general business, consulting, beauty salons, hairdresser salon, legal and medical services, etc.) with different types and designs of Appointment booking forms and various design solutions. 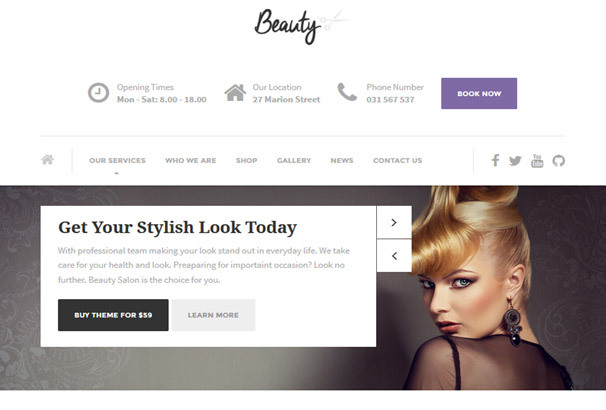 This hair, nail and beauty salon WordPress theme with the appointment booking plugin looks very modern and clean. Its main outstanding feature is that the theme is not overloaded with unneeded content modules and you can add any if needed. The booking options are implemented through the upper Book Now button, so your visitors are not lost and make their appointment pretty fast. As for customization opportunities, the theme provides an intuitive Page Builder by SiteOrigin and popular Visual Composer plugin, one-click demo data import, the options of WordPress visual customizer, sidebars and widgets, additional addons and much more handy options. This multipurpose business theme with the advanced booking form is a great choice for diverse website niches that manage events, actions, meetings, etc. 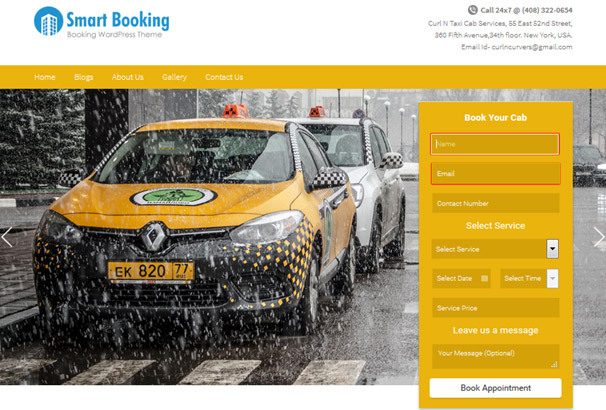 The custom Booking plugin of the theme can be easily framed up for different business services like gym classes, medical services, beauty salon, travel agency, etc. Moreover, this tool help you collect payments online and have all the process of working with the clients automated. The overall design is very trendy, simple and easily customizable. You are free to edit the theme via visual WordPress Customizer, change colors (choose from color from predefined color schemes), and more exclusive options. You also get the theme wit 5 blog formats, fully widgetized sidebar, and all must-have content modules. 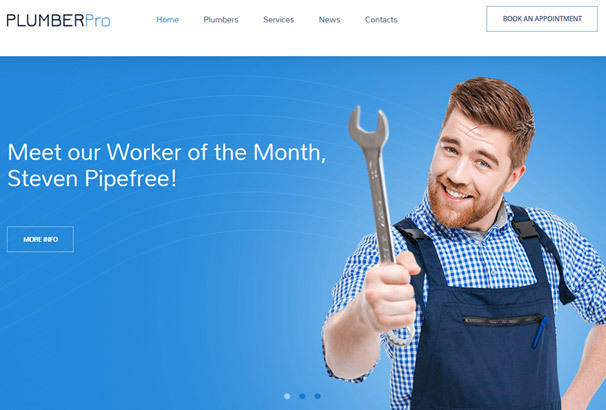 Entrepreneur is a very lightweight, clean and smart WordPress theme for small business. It’s not overloaded with unneeded functionality, very smooth and attractive. The appointment booking form is featured right in the header, so the site visitors can quickly check the available dates. You can customize its colors to be the most suitable to your website. Your guests will be able to book an appointment with and without registration, and pay for the appointment online if you integrate the form with WooCommerce. The also features services and pricing table, cute gallery with hover effects, full-screen testimonials block and your blog. With a help of a built-in drag-n- drop MotoPress editor you can add any needed additional content module without efforts. A great theme for beauty salons with a variety of services. It comes with 3 cool demos with elegant fonts, soft colors and cool animation effects. It has a great hierarchy of content blocks, including logo slider, video slider, small online shop and, of course, the appointment booking form. Jacqueline also supports a full-width background image and sticky menu. To make an appointment, you visitors will need to click the appropriate button in header. They will be redirected to huge appointment form, which is very easy in use. The theme also has cool customization options: drag-n-drop page builder, lots of necessary, shortcodes and intuitive admin interface. “Clean-looking” is the most suitable description for the theme with such a name. All theme demo designs look really elegant thanks to a lot of transparency polished layouts. 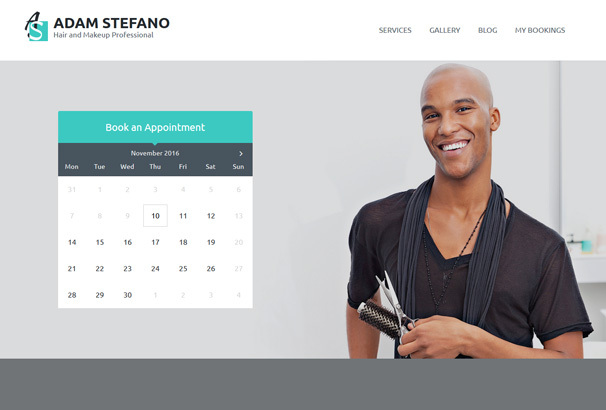 This template can be a successful starting point for a hair and makeup professional website or even a salon with a diversity of services. Apart from easy online bookings, the template is supplied with a variety of prebuilt skins, Google fonts and beautiful typography. Apart from great management tools including booking, you’ll also get Video Composer, Revolution Slider, various shortcodes, one-click demo data installation, sidebar manager, and Woocommerce instruments if you want to build a shop within your theme, etc. 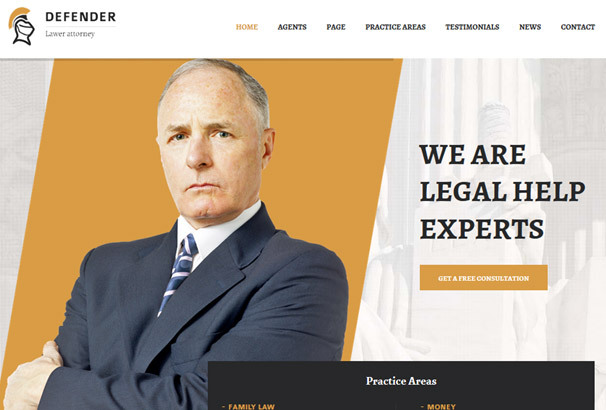 If you deal with law services, this is a great theme to present your business as authoritative and professional in your niche. 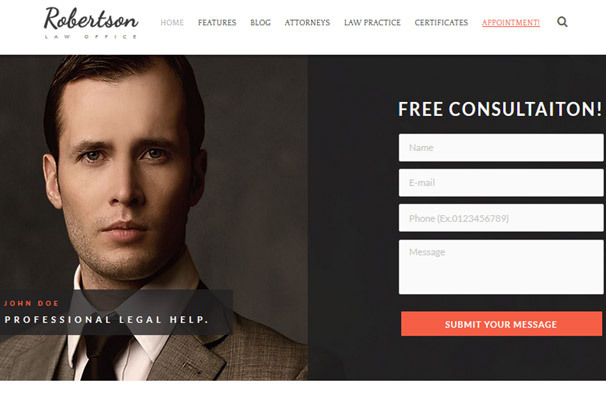 It’s perfect for attorneys, legal advisers, business consultants and other similar niches. The overall design is very modern. Appointment form shows the available and unavailable dates for booking right away, so it’s very intuitive to use for your audience. As for other features of the theme, there is a huge impressive list: a number of various headings (including a transparent one), Royal slider, Swiper slider, Revolution slider, menu configurator, side menu, custom menu, bookmark panel, parallax and video background, rating system, various Portfolio layouts, built-in Visual Composer, Media Content manager and more. 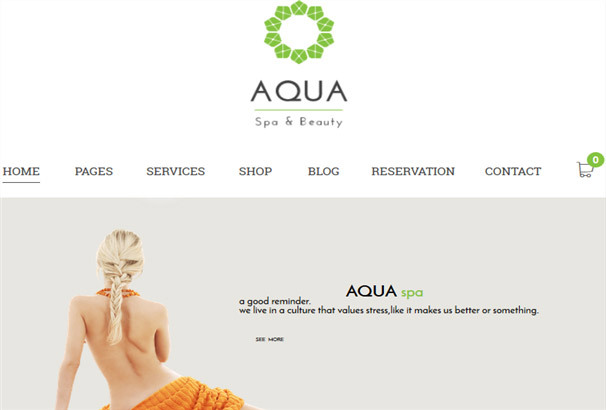 Bright and elegant theme for healthcare and beauty services that can be easily transformed into any related niches website. Built-in demos come with several color scheme alternatives and multiple customization options. 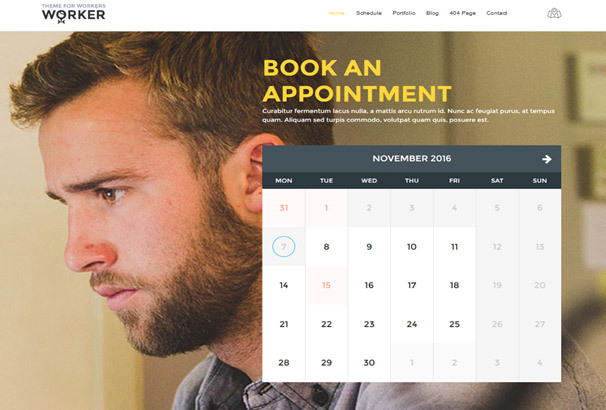 Appointment booking calendar works also great, you can personalize its design and options to suite your needs. The theme also comes with unlimited colors, layouts, sliders, drag-n-drop builder, various multipurpose galleries. In addition, it supports MailChimp integration to allow you enhance your marketing possibilities and keep users updated. One more theme with booking appointment calendar for legal services providers. Defender can be also adjusted to the needs of mentors, coaches, stylists and other small business professionals. It comes with a great professional design, custom posts and widgets, powerful admin panel, color skins and more. The theme is powered by custom Tesla framework allowing to manage each content and design area of your site easier. The built-in appointment booking plugin allows to collect custom info and let them manage their accounts and appointments. Very popular theme is the niche of medical services. It offers a couple of ready-made demos with a variety of layouts and can be used by absolutely different medical institutions. 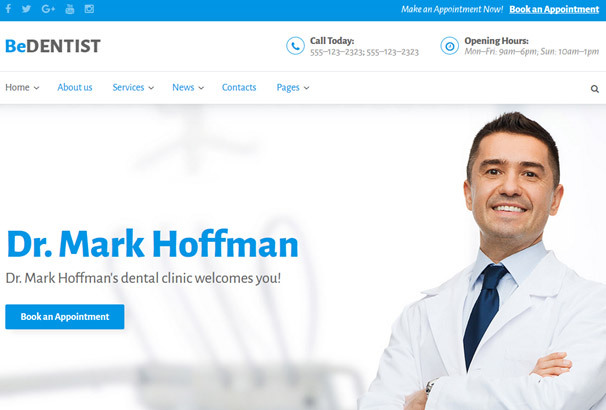 This can be also a great theme for a private clinic website. The template is also supplied with the advanced “Book a visit” form with multiple customized fields, so you should not have problems with adjusting it to your needs. The theme offers a wide range of headers and layouts, one-page style menu option, different front page blocks, a variety of parallax effects, Google fonts and multiple colors, built-in timetable and schedule, shortcode generator with integration to TinyMCE and much more useful options. 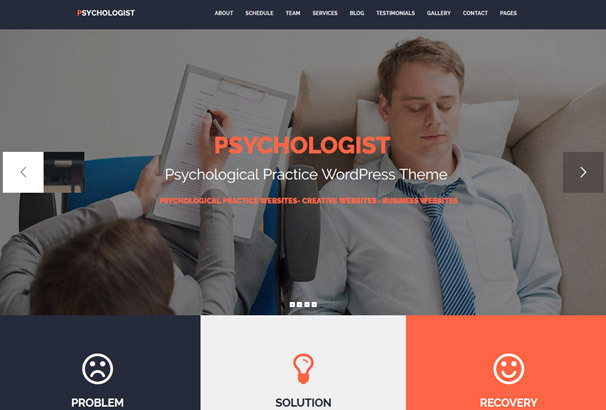 That’s a perfect theme for personal consulting website in any sphere: psychologist, mentor, coach, teachers, etc. the theme is extra clean and responsive – with a huge wide-screen header slider, services block, creative timeline of events schedule, a variety of multipurpose bold content modules, and appointment forms. To help with customization process, the theme is supplied with a drag-n-drop Page Builder, Slider Revolution, All Around Carousel and a lot of layout variations. The theme is translation and child theme ready. Another great theme with appointment manager. It’ll suite various plumbing, construction, building and other services. It’s a fast-loading theme with a focus services and high readability. All free timeslots available for booking are visible, so the customers choose the needed date faster. It’s shown as a button, so it doesn’t overload the website page. A live customizer is included into the theme by default providing you with happy times of adjusting the theme to your needs – you can update typography, menus, widgets and more. 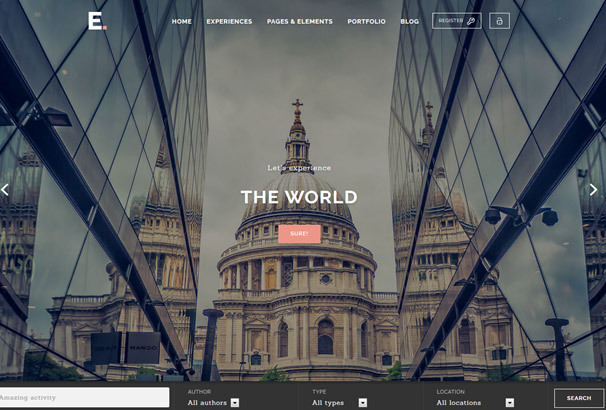 Very stylish and multipurpose theme with the right dose of animation. It can serve the needs of hair stylists, teachers, consultants, coaches, etc. Your potential customers will be able to book an appointment right from the front page – it’s hugely scaled and put into the spotlight. Apart from just booking an appointment, the customers can also change their own appointments if needed. The rest of the front page logically presents all standard content modules: services, pricing table, contact form, works, blog and other. Keep in mind that the theme doesn’t support WooCommerce. This is a very creative theme with a light of the moon – dark, stylish and mysterious. Exactly what you need for your Photographer portfolio or art-related website with the main emphasis on imagery. Moreover, it comes with 24 premade home page layouts, so you’ll probably face a problem of choice! If you provide any consultation or photo set services, the appointment booking form will help you manage the process quite easier. You can easily update the theme with a handy media manager, handy admin panel, unlimited layouts, 7 menu styles, sidebars and widgets alternatives. The theme also supports multiple post formats, allows to create password-protected galleries and set copyright protection. 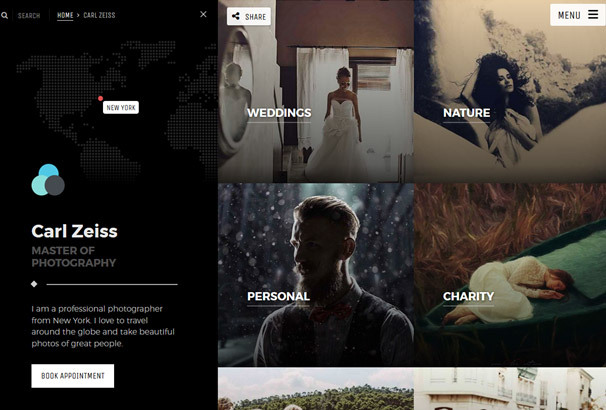 With this theme you can also sell the images online easily. 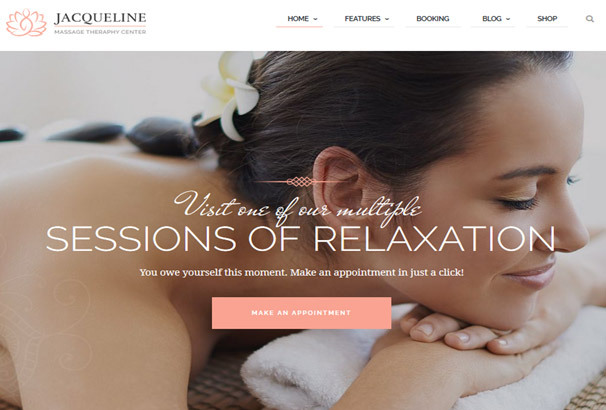 This is a very elegant theme with an appointment booking form for a beauty salon, massage centre, healthcare salon, and other related niches, where online bookings are acceptable. “Make a reservation form” for a salon allows to choose not only dates, but also a needed service and a person responsible. Customization options are also great: front page drag-n-drop builder, a variety of fonts at your hand, Revolution Slider, shortcodes, sidebar manager, custom widgets and more. 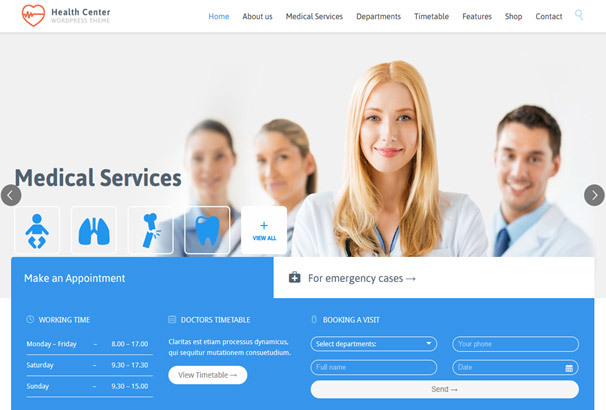 Design of this medical WordPress template can be suitable for multipurpose related niches like dental rooms and private medical clinics. It has the main emphasis on featuring the key benefits of your business, contact info and of course, an online booking form to reserve an appointment. The form is very user-friendly for your prospective clients who will be able to find available dates for booking in a couple of minutes. For WordPress beginners the editing process is going to be a breeze as the theme comes with an implemented custom Power visual builder with 25 available content modules, ready-to-use layouts, customizable colors, etc. The front page is also fully customizable via a visual editor, so you can update a logo, main colors, etc. It’s a fresh and professional multipurpose booking WordPress theme with its own unique style. The overall design offers huge hi-res images, big fonts, smooth Parallax effects and highly readable clutter-free content areas. As for booking purposes, the theme even allows your customers to proceed with online payments as the forms are integrated with PayPal. Experience also comes packaged with 4 pre-made modern demo layouts for you to choose the most suitable one faster. It can be quickly installed thanks to 1-click demo installation and customized without efforts thanks to a drag-and-drop editor that comes with the theme. Experience is also rich in terms of portfolios, widgets and premium custom functionality like User areas and rating systems. 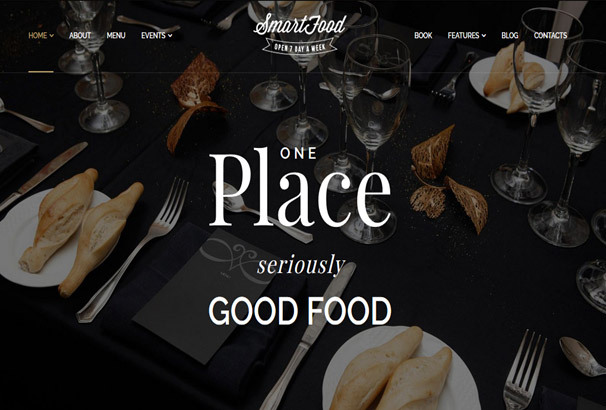 If you opened this article to find a WordPress theme for your restaurant or cafe with a table reservation online form, you’ve already found it. This clean, attractive and relatively affordable theme won’t only help you build an ultimate online restaurant, but will also allow your prospects to book a table online allowing you to manage all bookings easier. In terms of customization, the theme is a perfect choice for non-techs: it offers visual customization tools to edit the colors, layouts, skins, etc. In addition, the theme is compatible with the Events Calendar, MailChimp and is well-documented. The list of multipurpose shortcodes is also available within the themes. 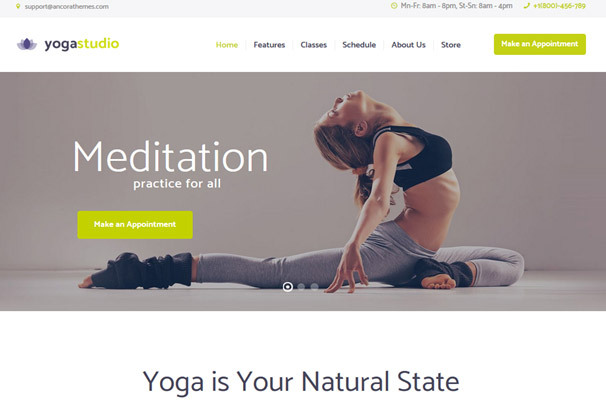 This clean WordPress theme with smooth animation, custom bright icons, and a full set of the needed functionality is a reliable solution for your yoga classes, gym and any other sport institution that are based on specific schedules. With this theme your schedule becomes interactive thanks to a built-in booking calendar. So, the prospects can not only preview the dates of the lessons they are interested in, but book the needed ones instantly. The theme is customizable with a help of a popular drag-and-drop Visual Composer plugin. In addition, the theme offers 3 homepage layouts, Revolution and Swiper sliders, shortcode generator and dozens of other features. 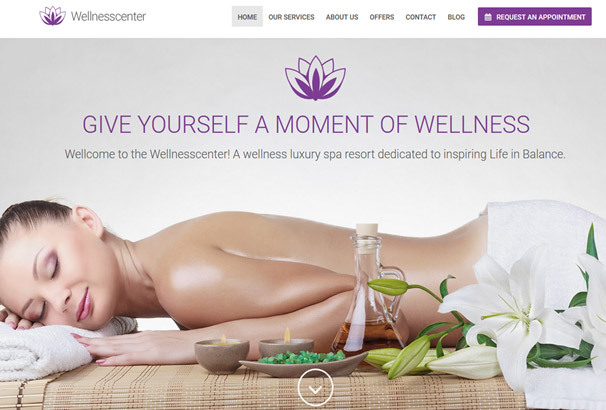 The theme is also WooCommerce ready. And one more theme in this collection is devoted to political purposes. 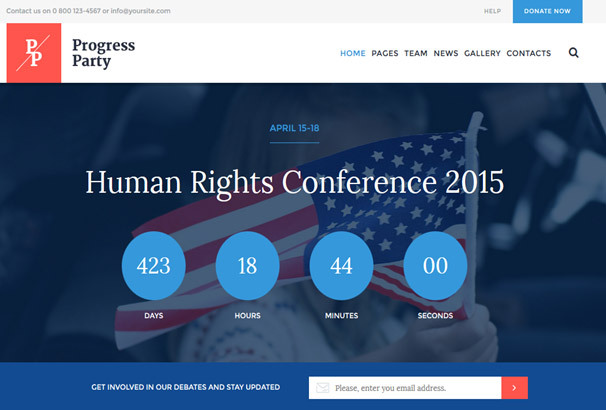 ProParty WordPress theme allows to create your trustful online representation and allow people to book a meeting with a needed party member or register for any political event. The built-in booking calendar shows the available dates for booking and allows to choose a person you want to have a conversation with. The theme can be customized with a shortcode builder and a visual editor. Moreover, you get a number of headings to make the site more unique, sliders to feature the main products, services or events, multiple gallery styles, numerous hover effects, and a custom widget set. The theme is very clean and built in best color schemes for building a trustful business image across the net.